В дискуссии на реддите о "теориях фанатов" есть много забавных и не очень рассуждений. Отдельно отмечу хорошо написанный аргумент о том, кто такой на самом деле Том Бомбадил (англ.) в "Властелине Колец" Толкина - и нет, речь не идет о гипотезе, что он Илуватар. Young people are getting hooked on the internet more than drugs, a new report says. As many as 250,000 14 to 24-year-olds are now addicted to the internet, while drug abuse is dropping. For girls the irresistible pull of social networking, for boys the escapism of online gaming. Teenagers - particularly those that fail to find work after leaving school - are increasingly turning to online distractions rather than substance abuse, according to a government report published on Tuesday. Particularly worrying is the trend toward “excessive or pathological computer game and internet use,” Drug Commissioner Mechthild Dyckmans, author of the “Drug and Addiction Report 2012.” told the Berliner Morgenpost newspaper on Wednesday. The report also says more young people are gambling than ever before. In 2011, around 25 percent of 16 and 17-year-olds said they had played a commercial gambling game in the past 12 months, compared with just 15 percent in 2009. Above all, young males out of work are most likely to become addicted to online games or public slot machines, said the paper. The number of young males aged 18 to 20 who said they had used a slot machine at least once in the past 12 months has increased by 14 percent since 2007. Twice as many girls are now using slot machines as in 2007, with the figure now up to 5.5 percent. The government is now looking at ways to better protect young gamers, including closer surveillance, tougher requirements and higher penalties, Dyckmans told the paper. The good news is that 20 percent fewer people overall died of drug addiction last year, the lowest figure since 1988. While millions in Germany still have drug-related problems, young people are now indulging in a cigarette, drink or joint in fewer numbers. The number of young smokers has reached an all time low, with under half the number of 12- to 17-year-olds lighting up last year compared to 2001. Meanwhile more young people than ever before – 70.8 percent - said they had never smoked a cigarette, compared with just 40.5 percent in 2001. “In many areas the measures taken to limit the consumption of addictive drugs have been effective, especially among children and young people – the group which is most vulnerable,” Dyckmans told the paper. Overall, binge drinking among 12 to 17 year olds has also fallen from 22.6 to 15.2 percent over the past ten years. But many young people are still prone to drinking themselves into a coma, with just under 26,000 drinkers aged 10-20 being admitted to hospital with alcohol poisoning in 2010. … Мы - дети последовательных неудачников. Давным-давно, чуть ли не в кембрии, а может, и в эдиакаре, разошлись предки первичноротых и вторичноротых. На планете царили предки членистоногих, всякие трилобиты, такие подводные мокрицы, и прочие членистые ребята, и предки моллюсков, и сбоку ютились вторичноротые, у которых рот не прямо там, где анус, а с другой стороны, чем они и отличаются от простых и честных зверей иной природы. Пытались вторичноротые выжить пытались, да все и перемерли, от них и остался-то черенком только мир иглокожих, всяких морских ежей - и совсем уж невидная веточка хордовых, на которых смотреть страшно, такая хлипкая веточка, асцидии эти, аппендикулярии. Так мы проиграли в кембрии, что-то 500 миллионов лет назад. Потом немного расправились, рыбы пошли плавать. В рыбьем мире много было вариантов. Наши предки - из самых лузеров. Победили, конечно, лучеперые рыбы, караси да щуки. Серьезная рыба, эффективная. А проиграли всякие кистеперые, которые убрались в мелкие да невидные экологические книши и спрятались там от честной конкуренции. Эти кистеперые, считай, вымерли, перекинулись в ископаемых, там всего-то и осталась малая веточка на развод, полезла от отчаяния на сушу. Проиграли океан, ушли в практически непригодные для жизни условия, прозябать да горевать. Выйдя на сушу, в отсутствие конкурентов доигрались до рептилий. Их был целый мир, совершенно разных, и там противостояли две группы. С одной сторооны - динозавры, конечно, но там и предки птиц современных, и крокодилы, и змеи. В общем, все рептилии - это диапсидные рептилии, такая победительная группа. Нормальные звери, все при них. Вес, рост, интеллект, зубы, двуногость... А проиграли - синапсидные рептилии, в пермском и трасовом периоде было их множество, но повыбили их эволюция на пару с естественным отбором. Наехали и повыбили. Эти синапсидные, зверообразные рептилии и стали предками млекопитающих, наследственно-проигравших. В расцвете синапсидные были здоровенные, крупные такие, заглядение, а как проиграли - одна мелочь пузатая да волосатая осталась. От них всякие мыши и пошли. Примитивных млекопитающих много было, но ежели грубо - соревновались между собой две примитивные группы, грызуны да приматы. Те и другие под одно заточены, мелкие такие шнырливые и проникающие тварюшки. И грызуны, конечно, победили, мыши наглые приматов потеснили да повытеснили. Вышибли из привычных мест обитания, загнали на деревья, сделали из честного примата - тонкого лори. Видели? Лузер. Грызуны с зайцами вместе объединились и приматов нещадно обыграли. Вот от несчастной жизни они там, на деревьях, в маргинальном местообитании, и дошли до жизни такой, нашей. Это же не повод для грусти, правда? Iranian Supreme Leader Ayatollah Ali Khamenei’s own words have now become a victim of Iran’s massive online censorship infrastructure. According to Radio Free Europe (RFE), last week Khamenei issued a “fatwa,” or religious edict, confirming that anti-filtering tools and software are illegal in Iran. The decree came in response to a question by Mehr News (Google Translate), a semi-official news agency, which had asked for clarification on the ruling due to the fact that, as journalists, employees sometimes need to access blocked websites and other non-authorized information. Khamenei, according to a translation by RFE, replied: "In general, the use of antifiltering software is subject to the laws and regulations of the Islamic republic, and it is not permissible to violate the law." However, his own use of the word “antifiltering” apparently triggered Iran’s own filtering system, making Khamenei’s words inaccessible to most Iranians. RFE also reported that this filtering episode prompted Tabnak, a conservative news website, to respond: "The filtering of a [religious] order is so ugly for the executive [branch] that it can bring into question the whole philosophy of filtering." Iran, of course, has a notorious surveillance and filtration system in place—just last month, the Islamic Republic published a "Request for Information" for furthering its so-called "halal Internet." This weekend, Facebook disabled the app and "single sign on" service for the online music streaming service Grooveshark. While Grooveshark initially apologized in a blog post, saying the disabled services must have been an error on Facebook's part, Digital Music News confirmed that Facebook actually cut ties with Grooveshark due to a copyright infringement complaint the social media giant received. "We have removed the Grooveshark app due to a copyright infringement complaint we received," Facebook officially stated. Facebook has not yet responded to our request for further comment. 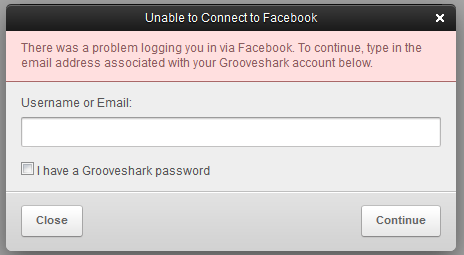 At the moment, users can not sign into Grooveshark with a Facebook username and password, or post tracks on Facebook via the Grooveshark Facebook app. Grooveshark has not made any public statements since the blog post this weekend, which incorrectly claimed, "We believe [the services] were disabled in error and we are in communication with Facebook to try to understand exactly what’s going on, so we hope to see a resolution to these problems soon." The post also said Grooveshark issued a temporary fix to the single sign-on issue, allowing those users with Facebook log-ins to sign on with their e-mail addresses. The online music streaming service has been the target of many copyright infringement complaints where similar services like Rdio and Spotify haven't, in part because Grooveshark allows users to upload their own music and share it with others. While Grooveshark says it takes down tracks in response to DCMA infringement notices, that hasn't stopped the service from getting into hot water with four major record labels (EMI, Universal, Sony, and Warner) earlier this year. Facebook's recent move promises to cause huge headaches for the already embattled Grooveshark. And some companies may be concerned by the fact that Facebook can, without warning, revoke access to the log-in service that they depend on to authenticate large portions of users every day. When Ars asked a spokesperson for Grooveshark whether the company was doing anything to rectify its Facebook issues, she responded that Grooveshark was not sharing any details beyond Facebook's public statement citing a copyright infringement complaint. This March, Israel passed what are now known as the Photoshop laws. The legislation requires all models to maintain a certain BMI, and all designers to disclose when they've photoshopped their models. Today, The Atlantic posted a thorough look into the making of the laws, and whether governments can intervene in a creative process that doubles as the root of disease for many teenagers and adults alike. The new laws require all models working in Israel to have a Body Mass Index (BMI) over 18.5. People with BMIs under 18.5 are generally considered underweight, and while being underweight doesn't constitute an eating disorder, politicians claim that most models aren't underweight and eating healthily. Rachel Adato, a former gynecologist and current politician who pioneered the bill, reported that Israel sees 1,500 new cases of eating disorders every year. Israel's Photoshop laws will also prohibit any undisclosed airbrushing, computer editing, or other kinds of photoshopping to make models appear thinner. Advertisers that choose to edit their models' photos must clearly state that fact to the viewer. International advertisements must comply with these regulations to have their ads placed in magazines or on billboard space sold within Israel. While some decry the laws as a blow to free speech, many see them as a way of protecting vulnerable people from a very real and deadly disease. But psychologically, eating disorders aren't always simply about seeing an image and wanting to be that image (if that type of causation were always true, then video games would make more violent personalities). "Developing an eating disorder is a complex process in terms of specific constellation of personality traits that one's born with," Daniel La Grange, professor of psychiatry and director of the eating disorder program at the University of Chicago told The Atlantic. "Genetic, environmental, societal things have to come together in a vulnerable individual, so it's not just one piece that makes it possible." Israel's laws likely aren't expected to have an effect on computer editing in America, where eating disorders are as much of a problem. Recently, a 14-year-old girl (and 26,000 signatories) petitioned Seventeen Magazine to run at least one spread per issue without digital photo manipulation. While Seventeen didn't make any promises, its campaign did make headlines in photography, fashion, and feminist circles. — The head of the Russian space program comes to visit us soon… They have great tea!